After two unimpressive seasons to start his college career at Kansas, Jeff Withey finally burst onto the scene as a junior, ranking second in our database in blocks per 40 minutes pace adjusted, trailing only 2012 NBA Draft #1 pick Anthony Davis. From a physical standpoint, Withey has made some nice strides since the last time we profiled him, filling out his frame some and adding notable lower body strength. Withey has benefitted from a lot of time in Kansas' weight room and working with a Kansas coaching staff that has a well-deserved reputation for developing big men. On the offensive end, Withey does most of his damage finishing on simple cuts and open looks around the basket, where he does an excellent job utilizing his size and length to finish easily at the basket. He does a good job elevating when he takes one or two steps to build momentum, and doesn't really need to get up very high to throw down a dunk given his standing reach, though he has more trouble getting off the ground from static positions. Withey actually shows some struggles finishing when he has a man closely defending him and he isn't able to build momentum, not having the raw explosive power to elevate and finish through contact consistently. He makes up for this with a solid touch in his finesse game, showing the ability to score on lay-ups and hook shots around the rim, but he's still developing the feel to know which situations to rely on finesse and which on power. Withey's post game isn't as far along as his ability to finish on cuts around the rim, as he's still developing his arsenal of moves and footwork. He's gotten better at using his size and strength to back down his man in the past year, being much more confident and capable establishing himself in the paint. On the other hand, despite good coordination, Withey isn't the most fluid player around, and he can be a bit slow in some of his post moves, not easily getting separation and struggling when the defense collapses on him. He shows solid ability with his hook shots and going forward would probably be best served focusing on simple moves he can get off quickly that take advantage of his massive size. The rest of Withey's offensive game isn't worth much mention, as he unsurprisingly has little in the area of perimeter skills. He's probably never going to be (and shouldn't be) one to put it on the floor in face-up situations, though he does show some potential with his mid-range jumper. Withey shot a very impressive 79.5% from the free-throw line on a significant 4.0 attempts per game, though it's yet to translate to live action, as he hit just 2 of his 16 jump shot opportunities on the season according to Synergy Sports Technology. This is definitely something to watch out for this season, and adding this wrinkle of versatility could certainly improve his stock. The defensive end is where Withey really makes his impact at the collegiate level, where he's a very effective shot blocker in both man and help defense. Off the ball, Withey does an excellent job positioning himself, rotating, and being aware of everything on the floor, showing good timing and decision-making going for shot block attempts. He's also done an excellent job cutting down on his propensity for fouls, dropping from 6.4 to 3.9 personal fouls per 40 minutes pace adjusted last year. In man-to-man defense, Withey's post defense is extremely impressive, as he does a great job utilizing his size and length to his advantage in matchups. Despite not having the greatest lateral quickness, Withey is rarely beaten laterally by his man, as he does a terrific job using his wide stance and long arms to keep his man at bay. His timing blocking shots in individual defense is superb, and he uses every inch of his very long reach to contest shots. Withey actually does surprisingly well when he's put on the perimeter defensively, again using his length very well to defend his man while still giving himself enough space to adjust if a drive to the basket ensues. He does a good job using his length and timing to block and contest shots from behind when he does get beat. Withey's pick-and-roll defense is less promising, however, as his lack of great change of direction ability obviously is exploited more there, and that may always be something he doesn't excel with. Looking forward, Withey made exceptional strides with his game as a junior and brings an interesting set of tools to the table for a big man. He has some pretty clearly defined strengths and weaknesses on both ends of the floor, though is obviously still developing and is just scratching the surface of his potential in some areas. His lack of great athleticism will always leave him somewhat limited in some areas, but he's still growing into his body and probably could still benefit some from additional lower body strength. Withey could help his stock most this year by becoming a better finisher from standstill positions around the basket, developing a simple, go-to post move to take advantage of his size, and translating his free-throw shooting prowess to a serviceable mid-range jumper, all of which are well within his reach to do. Jeff Withey averaged just 2.5 points per game as a sophomore at Kansas and has never scored more than eight points in a game during his career. Yet the 7-foot redshirt junior was ranked ahead of NBA lottery picks Klay Thompson and former teammates Marcus and Markieff Morris coming out of high school. Now that the Morris brothers are in the NBA, scouts will be watching to see if he can assume a larger role and live up to his significant high school hype. Originally committed to Louisville, Withey started his college career initially at Arizona. He requested to leave the program following the abrupt retirement of Lute Olson just weeks before the start of his freshman season, but was denied. Eventually he was given his release and transferred to Kansas, where he sat out a full year and became eligible after essentially missing out on the first season and a half of his college career, something that undoubtedly set him back. Withey looks the part of an NBA center, standing around 7'0 with an excellent wingspan and a broad-shouldered, though underdeveloped, 240-pound frame. He is a year older than most of his classmates so it will be interesting to see how much stronger he looks after another offseason of strength and conditioning in Lawrence. He is a good athlete for his size, though, both mobile and reasonably explosive around the basket. Withey is still an extremely raw player despite going into his fourth year of college--not a surprise considering that he has only seen around 200 minutes of actual game time in his career thus far. He's never really been a part of any meaningful playing time, usually playing at the tail end of blowout wins or losses, so it is difficult to evaluate him on either side of the ball. While watching him in the post, it is clear that Withey lacks toughness at the moment, not possessing the strength or aggressiveness needed to back his man down, often choosing to fade away from contact. His footwork is equally unrefined and untested, but he did show some basic moves from jump hooks to drop steps that, combined with his soft touch around the basket, suggest his post-game could develop with greater minutes. He struggles nearly every time he has to put the ball on the floor, however, and ranks as one of the most turnover prone centers in our database, coughing the ball up on over 22% of his possessions. On defense, his lateral quickness seems below average and he therefore struggles significantly chasing his man onto the perimeter. Though he lacked the strength to be a factor in the post as a sophomore, he is a solid shot blocker due to his timing, showing good timing in limited minutes last season. Conversely, he is also the most foul-prone player amongst prospects in our database, averaging 6.4 fouls per 40 minutes pace adjusted, which partially explains, among many reasons, why he did not see many minutes. 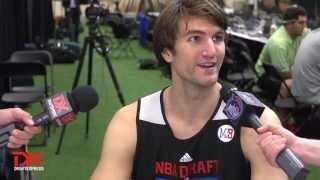 Obviously, Withey has a long way to go before realizing his potential at the collegiate level. While he is very raw from a skills perspective, players in his mold are rare commodities at the professional level. Considering his pedigree, as well as Kansas' track record with developing big men, he's certainly a player worthy of keeping a close eye on. There is no doubting his intriguing physical tools, but scouts will be watching to see if he can take a significant step as a junior and contribute for the first time in his career.